Wonkfest Or Slugfest? Anticipation Mounts Ahead Of Biden Vs. Ryan : It's All Politics Vice presidential debates are often quickly forgotten, but tonight's matchup — featuring what one pundit calls "probably two of the most substantive vice presidential candidates we've ever had" — will likely be widely watched. Both men are steeped in policy but offer big contrasts in styles. 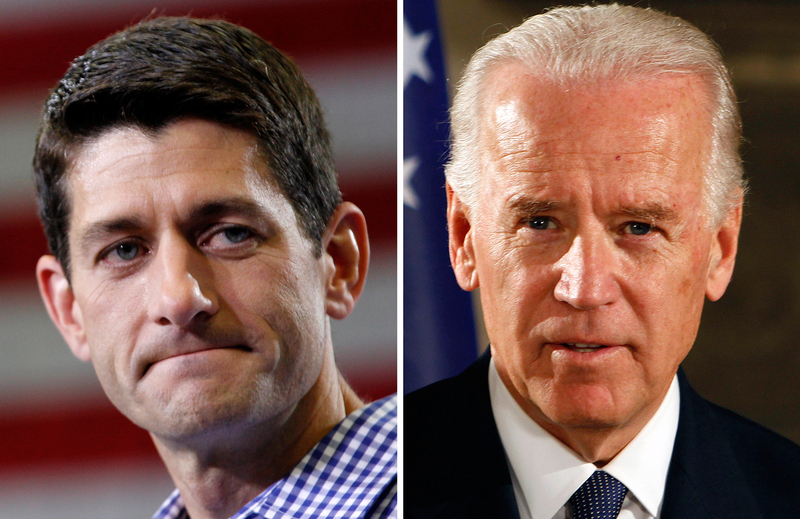 Tonight's faceoff between Vice President Joe Biden (right) and GOP Rep. Paul Ryan of Wisconsin will likely be an important stage-setter for next week's second presidential debate. It may be the undercard to the main event, but partisans on both sides are talking some trash ahead of the vice presidential debate tonight in Danville, Ky. The pressure is particularly intense on Vice President Joe Biden, following his boss' lackluster performance in last week's presidential debate, which moved GOP nominee Mitt Romney into a national polling lead. Republicans have been gleefully anticipating this confrontation for months, believing Rep. Paul Ryan of Wisconsin, the No. 2 on the GOP ticket, has the intellectual firepower to make gaffe-prone Biden look foolish. "It's the man with the 200-pound brain vs. Crazy Uncle Joe," says Ed Goeas, a Republican pollster. Democrats believe Biden will come well-prepared and be able to expose what they see as the duplicity of the Romney-Ryan ticket, which has appeared to shift positions in recent days on issues such as abortion, education and tax policy. "I just think Paul Ryan is the Eddie Haskell of American politics, with this transparent two-facedness," says Paul Glastris, a former speechwriter for President Bill Clinton and editor in chief of The Washington Monthly, referring to a smarmy character on the 1950s sitcom Leave It to Beaver. Vice presidential debates are often quickly forgotten, but this one will likely be widely watched and at the very least serve as an important table-setter in advance of the second presidential debate Tuesday in New York. "It will be very substantive, with probably two of the most substantive vice presidential candidates we've ever had," says David Carney, a Republican consultant. "I think Biden's performance, in an ironic way, will put more pressure on [President] Obama for the next debate." Four years ago, the vice presidential debate between Biden and Republican Gov. Sarah Palin of Alaska actually drew higher TV ratings than any of that year's presidential debates. This one also will draw considerable attention. "Because of the somewhat surprising but dramatic nature of Romney's performance last time, the stakes and the interest in this one are higher than normal," says Joel Goldstein, a law professor at Saint Louis University and expert on the vice presidency. Biden's task tonight is different from what it was four years ago. Then, he essentially ignored Palin in favor of attacking Arizona Sen. John McCain, the GOP nominee. This time, he'll still want to concentrate most of his fire on the other party's presidential candidate, but he will doubtless also use Ryan as a target. As the House Budget Committee chairman, Ryan is the architect of a spending plan that Democrats warn would gut domestic programs and threaten entitlements such as Medicare. "Where Gov. Romney muddied the water, I think the vice president will try to clarify it," says Jared Bernstein, who served as an economic adviser to Biden in the White House. "He's going to link the political agendas and the policy agendas so the electorate has a much better understanding than they did from the first debate." Since his selection as running mate, Ryan has served as the loyal soldier, shying away from some of the implications of his own budget and declaring that Romney sets the policy for the ticket. But if Democrats accuse the Republicans of duplicity, Republicans counter that Democrats have mismanaged the economy and don't have a record worth running on and so are relying on scare tactics. Goeas, the GOP pollster, predicts Ryan will drive home the point that, counter to Democratic claims, the Republican plan would not alter Medicare for those ages 55 and older. "Certainly, Ryan's quite comfortable on the economic stuff, but the ticket is also emphasizing more foreign policy in recent weeks because of that Benghazi mess," says Gary Bauer, president of American Values, a conservative group concerned with social issues. "If that comes up, I would expect Ryan to be on the attack and Biden on the defensive." Republicans also hope that, under pressure, Biden could once again uncork a comment that takes on a life of its own. As Goldstein points out, one gaffe can undo all the other successful messaging a vice presidential candidate might pull off during a debate. Last week, Biden attacked the GOP tax plan, but in so doing offered what sounded like a criticism of his own administration by saying the middle class has "been buried the last four years." "He's had a bad run of foot-in-mouth disease," says David Yepsen, director of a public policy institute at Southern Illinois University Carbondale. "He really needs to avoid any of that. Part of getting Democrats back on track is having Joe Biden not make gaffes." But Biden's gaffes tend to come "from unregulated exuberance on the campaign trail," Bauer says. He'll presumably be more disciplined on stage during his key moment in the entire campaign. And Republicans who have anticipated Ryan overmatching the vice president are likely to be disappointed. Biden spent 36 years in the Senate, chairing important committees in charge of both domestic and foreign issues. "Paul Ryan is a wonk at heart — he's the brains of this particular Congress," says Tara McGuinness, executive director of the Center for American Progress Action Fund, the progressive think tank's advocacy wing. "Joe Biden, though very experienced in politics, is a storyteller at heart," she says. "It will be a strong contrast between Paul Ryan's actuarial style and Joe Biden's straight-talking, storytelling, tell-it-like-it-is campaign style." Ryan, who was born two years before Biden was first elected to the Senate, needs to show he has some "gravitas," Yepsen says. Republicans from Romney on down have tried to downplay expectations for Ryan's performance in recent days, pointing out that he hasn't engaged in a campaign debate since he first ran for Congress 14 years ago. Ted Kaufman, a longtime Biden aide who succeeded him in the Senate after his ascension to the vice presidency, says Ryan will be ready. "Ryan will do a good job," Kaufman says. "Anyone who has been a member of Congress for 14 years knows how to present their positions well and how to challenge the positions of the other side."